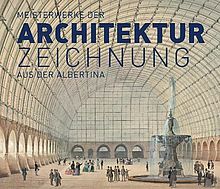 From the Late Gothic to the present day: The Albertina shows valuable architectural drawings by famous architects. Whether Baroque city views, magnificent Renaissance buildings or modern ensembles on Vienna's Ringstrasse - artists have always documented the urban past and sketched its future with the aid of architectural drawings. The exhibition "Masterpieces of architectural drawing from the Albertina" shows around 140 highlights from its own collection. The drawings span the period from the Late Gothic to the present day. Important sketches, studies, designs, vedute (realistic illustrations of buildings) and architectural capriccios by Lorenzo Bernini, Gottfried Semper, Theophil Hansen, Otto Wagner, Adolf Loos, Josef Frank, Clemens Holzmeister, Hans Hollein, Zaha Hadid and many others can be seen. The architecture collection of the Albertina encompasses 40,000 drawings from the beginning of the 16th century to the present day. The exhibition illuminates the history of this collection. It illustrates connections between architectural hand drawings and architecture theory. At the same time, cultural and socio-political developments can be traced. Thematic focal points of the show are illustration types, residential buildings, fountains, decorations, garden buildings, villas, color schemes, Historicism and Modernism as well as towers, domes and high-rise buildings.